There are a lot of potential firsts in this presidential cycle. Either Ted Cruz or Marco Rubio would be the first Hispanic president in history. Hillary Clinton, if elected, would be the nation’s first female president. And if Vice President Joe Biden wins, it would be the first documented miracle in the modern day. The media frenzy over Clinton’s potential for making history leads to this week’s trivia question … which is: who was the first woman to win a major-party presidential primary? Last week’s question was: who was the last senator to be indicted while in office who chose to resign? The answer? Harrison Williams, Democrat from New Jersey. 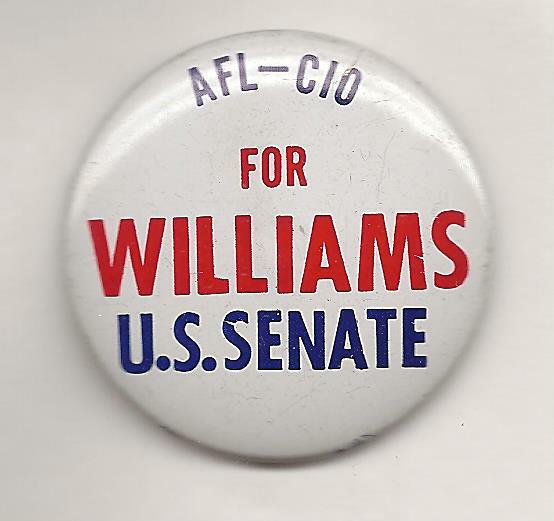 Williams was caught in the Abscam scandal, in which FBI agents disguised as Arab sheiks offered bribes to several members of Congress. He was convicted of bribery and conspiracy charges in 1980. In 1982, as his colleagues were preparing to expel him from the Senate, he resigned his seat. And the randomly-selected winner is William P. Davis of Grand Rapids, Michigan. Bill gets the coveted Political Junkie button!